Tariq Edwards and J.R. Collins both met with the media Tuesday evening, and special teams play was a hot topic. HOW MANY SPECIAL TEAMS DO YOU PLAY ON AND WHAT WENT WRONG? Well since the game I’ll be starting on pride (punt team) and back up on kickoff. We just had a big coverage issue. As far as people getting out. I don’t know exactly what they were doing wrong, just getting out flanked. They did a good job protection wise. WERE YOU NOT ON EITHER OF THOSE TEAMS? I was on Pride and then I ended up hurting my shoulder in camp. So they got Dwayne Alford starting that position. Now I’ll be going back to starting. DID YOU WONDER HOW THE KNEE WOULD HOLD UP? Not really, not really at all. I really didn’t think about my leg at all during the game. I was just excited to be out there. I had so much adrenaline that I wasn’t feeling it. WHAT’S CLICKING WITH THE DEFENSE? In particular I think even Coach Foster said that in the meeting that we did a great job tackling wise. I think there were maybe only 2 or 3 missed tackles the whole game. Starting off the season last year we didn’t do a great job of wrapping up. This year we practiced it all off season. WHAT DOES A GOOD START MEAN? It just gives you a boost for the next game. Just knowing that if we can play well versus the #1 team in the nation that we should be able to come out and perform every week. For me, senior season and missing out on so much last year, every game is a big game for me. I look at all them the same. And I’m going to go out there and perform the same every week. I think a lot of guys actually stepped up and went and met with coach Beamer and let him know that they’d love to participate and help as much as they could on special teams. We’ve been all about Beamerball and we kind of lost that in the first game. A lot of guys want to help us get back to that point. It’ll never be dead. Not just off of one game, either. You can always come out, work on your mistakes, look at film. See who didn’t perform or what went wrong and fix that for the next week. WAS IT LIKE RUDY WITH BEAMER? Somewhat. It wasn’t like a crowd of guys. You see individually that a lot of different people will come up and talk to you about going to talk to them. Just to get on special teams. Because a lot of the young guys even wanted to get on it. It was even J.R., James Gayle, a lot of the guys on defense of course. I think that came from the speech that coach Foster gave us after the game. Usually a lot of defensive guys are on that. DID YOU PLAY ANY WHIP AGAINST ALABAMA? Not really, we were just in certain formations if the back is weak and we have a tight end down I would make a switch call and I’d just get outside of the formation. But I really wasn’t playing any whip. DID YOU HAVE ANY ADDED RESPONSIBILITIES? We made a few match calls on the back side. If there were just two guys on the backside then me and the rover would switch positions basically. Overall he liked the defense’s performance. But as far as the special teams he was highly upset just like the rest of the coaches. So he just felt like we all needed to just get back. It’s such a vital part of the game that everyone needs to try to get on it. WAS SUNDAYS PRACTICE MORE CHIPPY? It was mostly special teams (laughs). We usually did it in the past last year, might have been a slight difference. I know usually we kind of change on the positions and he’ll come down. It’s usually when it’s only a nub side or it’s weak back side or the back is strong side. We just switch positions or we make a match call, where I took the number one receiver inside, he’ll take that one outside. And we’ve just been doing that switching responsibilities. But he won’t be normally be playing linebacker like that. WHY’D YOU OFFER TO PLAY SPECIAL TEAMS? I was a backup on special teams and after this week they moved me up to the starting position. DID YOU WANT TO DO THAT OR DID THEY ASK YOU TO? It was something I wanted to do. I never really considered special teams. 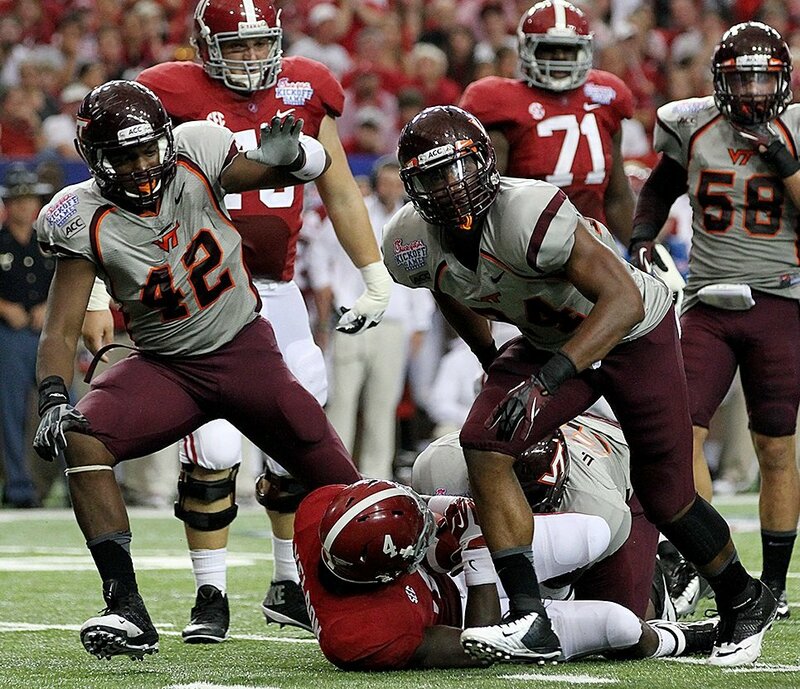 This year coach Beamer was saying how special teams can make a big impact in the game. A lot of our big time guys in previous years started on special teams. I thought it’d be a good idea for me to be on there since it’s such a big part of winning games. WHY WEREN’T STARTERS ON SPECIAL TEAMS FROM THE START? I guess coach Beamer felt like the team that was out there was the team that was going to help us the most. What happened after the game he didn’t like it and is looking for changes. HOW TAXING IS PLAYING SPECIAL TEAMS? I don’t think it takes anything off of you it’s just one play running down the field on the punt team. Doesn’t really take off any energy or anything. If anything it warms me up before I get out there. Nobody’s play surprised me. That’s kind of how we played during camp. I think it starts in practice. How are you going to play going out there every day in practice? Giving 100% you’re going to see the results in the game. IS THE TEAM DEEPER AT D LINE THAN IN PAST? Yeah I feel like we’ve got about 8 starters on the defense. There hasn’t been any drop off in the rotation. Yeah I think we’re picking up from where we left off last season. Last spring we made big strides of being a better D line. I think a lot of our production is coming out there every day in practice thinking that we’ve got to get better and we have something to prove. No not with the way we’re playing this year. We’re just going out there every game playing with the same intensity. We haven’t played our best defense yet, and every day we go out there we try to play our best defense. I think this year we just keep on with what we’re doing and fix what we messed up on last week and we won’t run in to the same problem we had last year. J.D. Howell (@JDHowellShow) is the host of the J.D. Howell show every Monday-Friday 4-6 PM, on ESPN Blacksburg, 1430 AM and 94.1 FM. Listen Online! It used to be a “Pride” thing to be on special teams. It looks like Beamer got away from that and the results have shown. Hopefully this is a lesson’s learned. (Beamerball) It’ll never be dead! Quote of the year, further nominations need not apply. Great seeing troops rally around their leader. I’d like to see some work on punt blocks this Saturday, we should, should, get plenty of opportunity. No offense to Edwards, but Beamerball (the special teams side of it) has been dead for awhile. The only blocks, big returns, etc. we get these days are against the Western Carolinas of the world. When was the last time we had a return for TD, block, or stuffing a runner deep in their side of the field, etc. against a good team? Compare special teams the last several years and say the Clemson game in ’07. Jarrett had a punt return for TD last year vs Pitt. Hosely was also a very effective punt return man. Believe he only scored one TD his whole career but he definitely had several long returns. Dyrell was one of the top kick off returners in the country as an underclassman and Knowle, while he didnt shot it on Saturday, was one of the tops in the country last year. IIRC, The rules changed a few years back and the 5 Yard Running in to the Kicker Penalty has been taken away and now it’s just the 15 yard roughing penalty. We were victims of this 15 yard way too often back in the Mid 2000s and Beamer has even stated that setting up a good return is just as important as getting blocks. Going after blocks is a high risk-high reward strategy that is needed when your talent level is lower than your competition. That is not the case anymore. There’s an intensity on this team. Can’t wait to see them play in person in Lane.